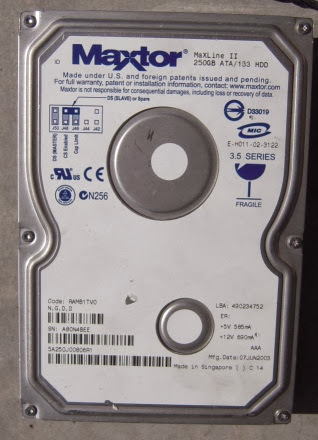 A number of years ago I got myself a Maxtor 250GB external hard disk which at the time I used for all my backups. It cost me a fair penny then (2003) and I can now in 2009 buy 4TB of space for the same amount. Don't think that I'm complaining though, I think that's great progress. Like all good hard drives it eventually died but it died a slow bit by bit corrupting death. It started to become inconsistent (that's when I should have taken an image of it) and then just started to corrupt and not be able to read data. Luckily I manage to recover all my important data and just lost a few albums of songs and movies that I could easily buy again. The drive had only lasted about 2 years and Maxtor refused to entertain the idea of replacing and knowing how much I'd spent on it I didn't want to through it away it so it went into the box of computer parts that every geek has. Years passed and during a cleanup I agree with myself that it had to go. I really couldn't remember what else was on it but I was pretty sure that a good hardware recovery technician could get data off it so I wanted to destroy it before disposing of it. To this end I pulled out a drill and started drilling holes in it. 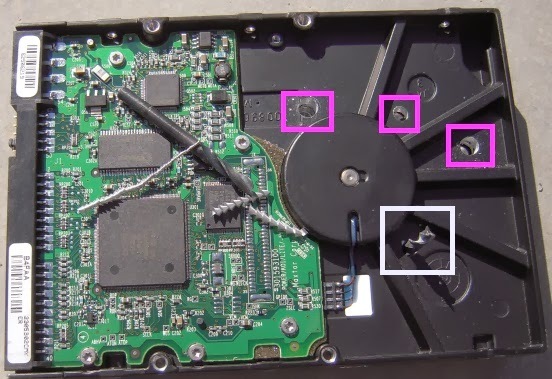 The white box around the photo below shows a broken drill bit and the other end of the bit is lying on top of the circuit board. With a larger and stronger drill bit I was able to get some deeper and more crippling holes into the disk before I decided that I had limited data recover-ability from it. When you read the instructions on how to handle these devices they always tell you to discharge any static before handling and work in a static free environment etc. I ignore all of that when I was doing this.